The software RP Fiber Power is suitable for simulations on any quasi-three-level gain media (both fibers and bulk crystals). You can even design your own energy level schemes in all sorts of processes for transitions between those levels. Optical amplification in the gain medium of a laser or laser amplifier arises from stimulated emission, where the input light induces transitions of laser-active ions from some excited state to a lower state. In a three-level system, the laser transition ends on the ground state. The unpumped gain medium exhibits strong absorption on the laser transition. A population inversion and consequently net laser gain result only when more than half of the ions (or atoms) are pumped into the upper laser level; the threshold pump power is thus fairly high. An example of a three-level laser medium is ruby (Cr3+:Al2O3), as used by Maiman for the first laser. Figure 1: Energy level diagrams of different laser systems. The horizontal lines indicate energy levels; the higher a line, they higher the corresponding energy. Left: a three-level system, where the laser transitions ends on the ground state. Middle: a four-level system, where the laser transition ends on a level above the ground state, which is quickly depopulated e.g. via phonons. Right: a quasi-three-level system, where the lower laser level has some population in thermal equilibrium. A lower threshold pump power can be achieved with a four-level laser medium, where the lower laser level is well above the ground state and is quickly depopulated e.g. by multi-phonon transitions. Ideally, no appreciable population density in the lower laser level can occur even during laser operation. In that way, reabsorption of the laser radiation is avoided (provided that there is no absorption on other transitions). This means that there is no absorption of the gain medium in the unpumped state, and the gain usually rises linearly with the absorbed pump power. The most popular four-level solid-state gain medium is Nd:YAG. All lasers based on neodymium-doped gain media, except those operated on the ground-state transition around 0.9–0.95 μm, are four-level lasers. Neodymium ions can also be directly pumped into the upper laser level, e.g. with pump light around 880 nm for Nd:YAG. Even though effectively only three levels are involved, the term three-level system would not be used here. A quasi-three-level laser medium is one with a kind of intermediate situation, where the lower laser level is so close to the ground state that an appreciable population in that level occurs in thermal equilibrium at the operating temperature. As a consequence, the unpumped gain medium causes some reabsorption loss at the laser wavelength, and transparency is reached only for some finite pump intensity. For higher pump intensities, there is gain, as required for laser operation. Examples of quasi-three-level media are all ytterbium-doped gain media (e.g. Yb:YAG, or Yb:glass as used in optical fibers), neodymium-doped media operated on the ground state transition (e.g. 946 nm for Nd:YAG), thulium-doped crystals and glasses for 2-μm emission, and erbium-doped media for 1.5 or 1.6-μm emission, such as erbium-doped fiber amplifiers. An important fact is that the spectral shape of the optical gain in a quasi-three-level laser medium depends on the excitation level, because this affects the balance between emission and reabsorption. As a consequence, the laser wavelength obtained may depend on the resonator losses: high losses require a higher gain, and thus a higher excitation level, and consequently a shorter wavelength of maximum gain. (Note that the reabsorption is stronger at shorter wavelengths, thus particularly reducing the short-wavelength net gain for low excitation levels.) Similarly, the wavelength of maximum gain can be reduced by reducing the doping concentration, because this also implies a higher excitation density. On the other hand, this measure may reduce the efficiency of pump absorption. Therefore, there can be a trade-off between short-wavelength operation (with small quantum defect) and efficient pump absorption. Figure 2: Gain and absorption (negative gain) of erbium (Er3+) ions in germano-alumino-silicate glass for excitation levels from 0 to 100% in steps of 20%. Strong three-level behavior (with transparency reached only for > 50% excitation) occurs at 1530 nm. At longer wavelengths (e.g. 1580 nm), a lower excitation level is required for obtaining gain, but the maximum gain is smaller. There can actually be a smooth transition from three-level to four-level gain characteristics with increasing laser wavelength. 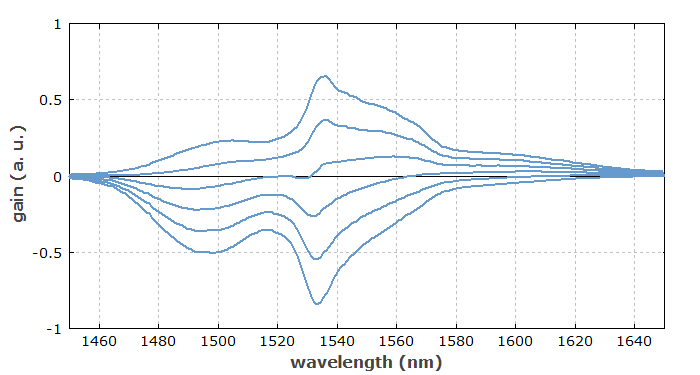 For example, erbium-doped glass (see Figure 2) shows strong three-level behavior around 1535 nm but nearly four-level behavior for long wavelengths of e.g. 1600 nm. Similarly, ytterbium-doped glass exhibits pronounced three-level characteristics for wavelengths below ≈ 1040 nm, and the same holds for Yb:YAG lasers at 1030 nm and for lasers based on many other rare earth crystals. For operation at such wavelengths, a large inversion density is required for overcoming the reabsorption loss. For longer wavelengths, as sometimes used particularly in fiber lasers, there is hardly any reabsorption, and in a long fiber only a very low excitation density may be required to obtain sufficient gain. Pronounced three-level behavior is inevitable for gain media with a very small quantum defect, because this enforces a small energy spacing between the lower laser level and the ground state, so that thermal population of the lower laser level is significant. By reducing the temperature of the laser crystal, it is possible to obtain less pronounced three-level characteristics, i.e., a reduced degree of reabsorption on the laser wavelength. This is essentially because the population in higher-lying sublevels of the ground state manifold is reduced. As an example, Yb:YAG has pronounced three-level characteristics at 1030 nm when operated at room temperature, while essentially four-level characteristics are obtained for cryogenic operation at 77 K (the temperature of liquid nitrogen). Note that the gain media of semiconductor lasers actually also behave like three-level lasers, exhibiting losses in the unpumped state and a shape of the gain spectrum which depends on the excitation density. It is sometimes not understood that the reabsorption does not constitute a real loss of energy, because it excites ions into the upper level, so that stimulated emission can again occur at a later time. Nevertheless, three-level characteristics tend to decrease the laser efficiency for other reasons: they require higher excitation densities, leading to higher losses through fluorescence, and they usually do not permit the gain medium to be made long enough for complete pump absorption, because reabsorption would dominate in weakly pumped regions. Another frequent mistake is to believe that (according to Einstein's original simple model) there are equal transition cross sections for stimulated emission and reabsorption, although this does not hold for effective transition cross sections of transitions between level manifolds with non-degenerate Stark levels, as often occur in solid-state gain media. The saturation fluence is often not calculated correctly: it is the photon energy divided by the sum of emission and absorption cross sections. It is not true that reabsorption in a three-level gain medium (whether in an unpumped region or not) acts like a saturable absorber, leading to Q-switching effects and the like. For such effects, the cross sections of the absorber would have to be larger than those of the gain medium. Blog article: What is different for quasi-three-level lasers?